This is a story about the courage and dedication of Elena Vasilieva, a Russian environmentalist who fiercely fights for social and environmental justice in Volgograd city, Russia. Elena moved to Volgograd from Moscow in the mid-eighties. She received her diploma as a teacher and worked at the Department of Journalism of Volgograd University for several years. Elena’s decision to set up an NGO was realized when an article written by her on the threats of a nuclear power plant in the Rostov region was published. This was the first time she realized the importance of environmental justice. Since then she has not stopped helping citizens and community groups gather and use information on violations of their social and environmental rights. This story is just one episode of her tireless work to protect people and the environment in Russia. High levels of mercury in fish is a serious problem for Volgograd citizens who already face numerous environmental and health issues. 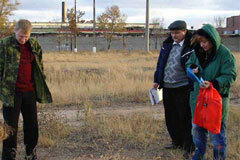 As the head of a small NGO “Volgograd-Ecopress” Elena sees her role as attracting the attention of the regional and municipal environmental authorities to numerous environmental problems in the region, focusing on mercury contamination as the major threat to people’s health and the environment. Mercury is a chemical of global concern owing to its long-range atmospheric transport, its persistence in the environment once anthropogenically introduced, its ability to bioaccumulate in ecosystems and its significant negative intergenerational effects on human health and the environment. This is the only heavy metal so far which is regulated globally by the recently signed Minamata Convention. Volgograd-Ecopress participated in the global “Mercury in Fish and Hair” project supervised by the International POPs Elimination Network (IPEN) and Eco-Acсord, IPEN’s Regional Hub for the Eastern Europe, Caucasus and Central Asia (EECCA) region. Volgograd-Ecopress collected important data that demonstrated high levels of mercury concentration in fish and the hair of people living in the vicinity of certain industries. The results revealed in the frame of the global fish and hair project were broadly disseminated to all stakeholders in Volgograd region, including local authorities. “We achieved broad media coverage and faced negative reactions from industries in the region”, says Elena. At the time of writing, the data gathered by Volgograd-Ecopress as part of the project is subject to ongoing court proceedings in Volgograd. In the meantime, Volgograd-Ecopress maintains that pollution resulting from industrial activities in the region has become worse. People regularly call the emergency centre set up by the NGO to highlight the environmental threats they face and to complain about severe health problems caused by toxic exposure. “Since then we have been in a daily battle. It involves local residents, entire families suffering from pollution, workers, the media”, says Elena. But she vows to never stop fighting for the right of people to live in a healthy, pollution-free environment.